We are very pleased to show you the end of year newsletter – which is absolutely jam-packed with news. 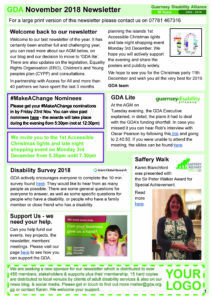 Don’t forget 3rd December – International Day of Persons with a Disability – celebrating in town – read more here. There you will find shops that are open, where accessible toilets are located, fun activities going on and how the community is supporting us. Please also read about GDA Lite – also available here. The diary of forthcoming events is really packed, notably with activities run by the Adult Disability Service. Read more here. We look forward to seeing you in town!